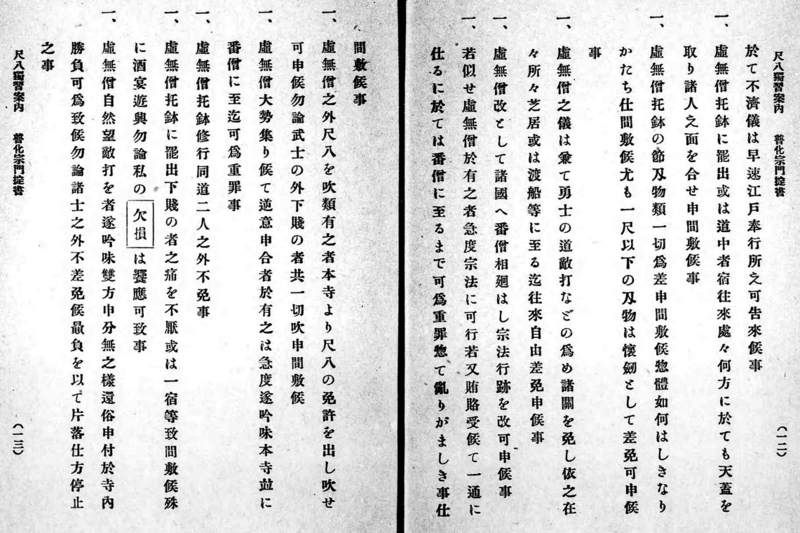 1751: The "Keichō Period Edict"
Dating: Komusō Shakuhachi traditionalists devotedly believe that this strange document was actually originally issued and signed in 1614, Keichō 19; by Shōgun Tokugawa Ieyasu, himself. That is simply impossible, only wishful thinking. Nothing but a myth - a sheer, yet also cunning fabrication. 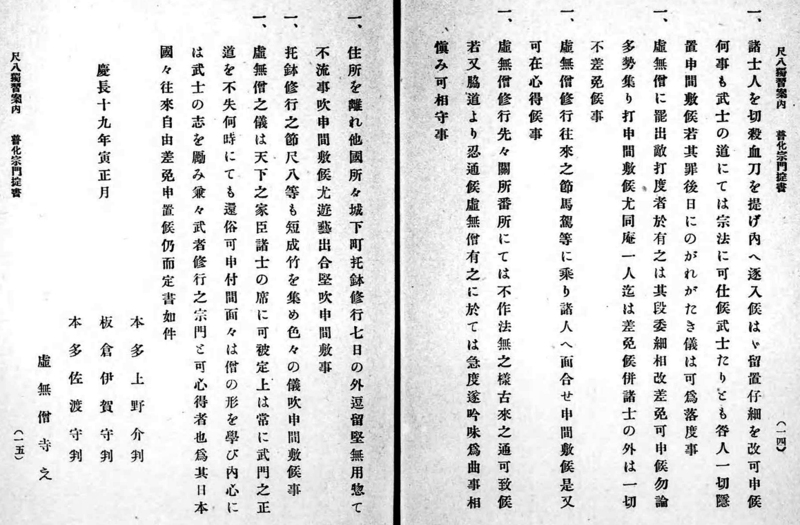 According to the Japanese shakuhachi historian Yamato Hōmei, the oldest version of this definitely fabricated document was created and appeared only as late as in 1751, Hōreki Period Year 1. Moreover, acc. 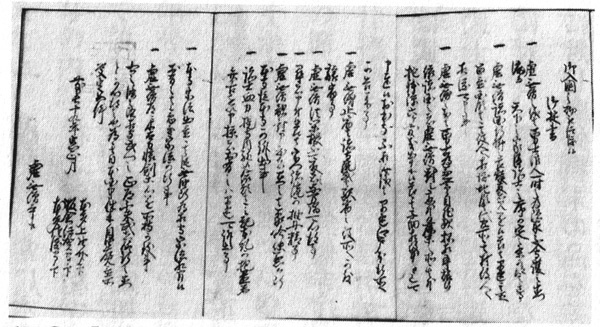 to japanologist Max Deeg, the oldest "attested" version of a Keichō no okitegaki document can be dated only as late as 1792! Deeg, 2007, p. 27. 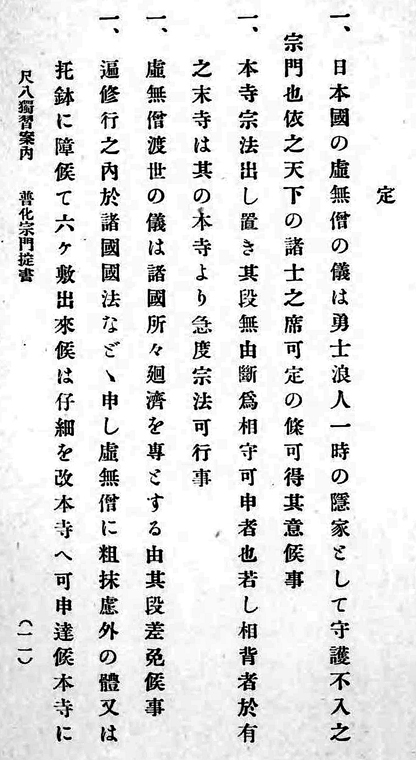 普化宗, Fuke-shū, in English: the "Fuke Sect", do not at all appear in any of the many known, surviving and published versions of the Keichō no okitegaki. 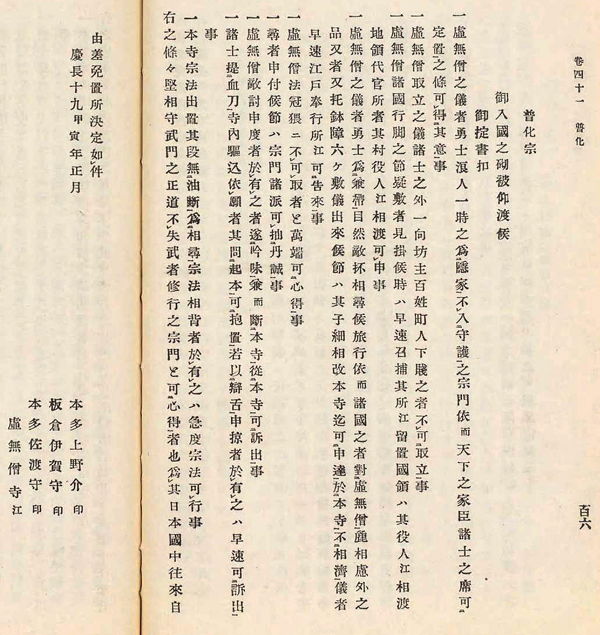 In: Tokugawa kinreikō, Book 5, Maki 41, 1932, pp. 106-107. Presented in Takahashi 1990, pp. 55-56. "1. The komusō fraternity is a religious group specifically designed to serve the needs of rōnin and samurai who wish to withdraw temporarily from the world. The temples of the komusō do not pertain to the jurisdiction of the authorities in which they are located. Furthermore, they are reserved only for the samurai. 2. Besides samurai, ordinary priests and people belonging to the lower ranks, such as peasants, traders or humble people, are not allowed to become komusō. 3. If a komusō chances upon a suspicious individual, he has the right to arrest him and deliver him to the local authorities. 4. A komusō is a samurai. Therefore during his pilgrimages he pursues his enemies. To this purpose, the local people should allow him to practice takuhatsu freely and offer him every assistance.. If someone causes his inconvenience, he should denounce him to the local komusō temple; if the grievance is not settled there, the komusō should report to the Bugyō-sho [the office of the Tokugawa-shōgunate that oversaw the affairs of Buddhist temples and Shinto shrines] in Edo. 5. A komusō should never remove his tengai [straw hood] without a serious reason. 6. The temple authorities and all members of the Fuke-shū* should assist in every way a komusō who is pursuing an enemy of the bakufu. 7. A komusō, prior to killing an enemy, has to receive permission from the parent temple. 8. When a samurai enters the temple's grounds carrying a sword dripping with blood, he should first be interrogated by the temple's authorities, prior to be given refuge. If his reasons are plausible, he should be given shelter; in the opposite case, he should be denounced to the authorities. 9. The parent temple issues the rules, and everyone should abide by them. Whoever disobeys should be punished. Remember! This is a religious sect for the bushi. Respect and abide by its rules! Do not forget the correct way of the samurai! Hence you are granted unlimited freedom to travel throughout the country." * Comment by T.O. : Do note that the term Fuke-shū, as here in Takahashi Tone's translaton, does not appear at all in any of the known versions of the Keichō no okitegaki! located and operating in Ranzan City, Saitama Prefecture, NW of present Tōkyō. Presented in Takahashi 1990, pp. 64-67. 1. The Japanese komusō fraternity is a religious group specially designed to serve the needs of ronin and samurai who wish to withdraw temporarily from the world. 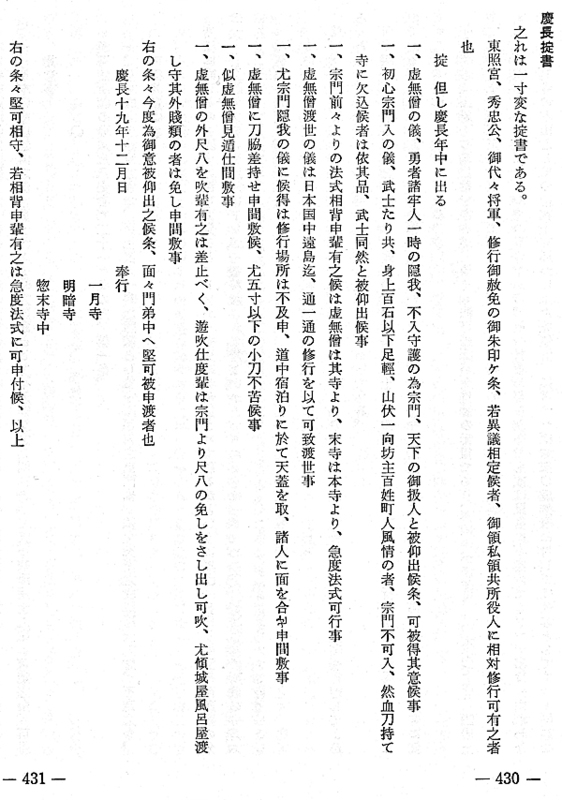 The temples of the komusō do not pertain to the jurisdiction of the authorities in which they are located. They are reserved only for the samurai. 2. When the parent temple issues the rules, everyone should abide by them. A komusō who belongs to a sub-temple will receive penalization from the parent temple. 3. When a komusō performs itinerancy, he is obeying the laws of his sect. Therefore, he must be allowed to do it freely. 4. When a komusō is practising takuhatsu in a foreign land, the town’s people cannot molest him according to the laws of that land. If the komusō is prevented from doing takuhatsu, he should report to the main temple. If the main temple is not able to handle the matter, it should be reported as soon as possible to the Edo Bugyō. 5. During a komusō’s pilgrimages, within the streets or in the lodging places, he is not to remove the tengai and show his face. 6. A komusō should not carry arms during his takuhatsu. He is allowed to have a dagger shorter than one shaku (30.3 cm.) and to hide it in his clothing. 7. A komusō is also a samurai who pursues his enemies during his pilgrimages. He, therefore, should be given free admission to shibai [plays], etc., and be exempted from toll fees and boat fares everywhere he goes. 8. The bansō [priest keeper] should be sent to all the country, to supervise komusō behavior. 9. If the bansō discovers a false komusō during his expeditions, he should deal with him according to the laws. If the bansō agrees to be bribed and sets the false komusō free, he, as well as the false komusō, will be rigorously punished. Therefore, be on guard and behave yourself! 10. No one is allowed to play the shakuhachi besides a komusō. If a samurai desires to play the shakuhachi, he should obtain permission from the main temple. Only samurai are allowed to play shakuhachi and become komusō. 11. If a komusō becomes aware of a komusō conspiracy, he should report it at once to the authorities. The participants, including the main temple and the bansō, will be punished severely. 12. When a komusō is practicing takuhatsu, he may have with him no more than one fellow komusō as his mate. 13. A komusō should not extort donations or lodging accommodation from the poor. In addition, feasts, banquets and ... [missing characters]. 14. When a komusō chances upon one of his enemies, they should both agree to ask for permission from the main temple to be relieved from their komusō status. They should duel on the temple’s grounds. The duelers are not allowed to received any external reinforcements. Only samurai are allowed to behave thus. 15. If a samurai enters the temple’s grounds carrying a sword dripping with blood, the temple authorities should first interrogate him, and then offer him refuge. If a samurai has precedents, he should not hide his past deeds, because if his sins are made known in the future, he will no longer receive protection from the temple. 16. A komusō may kill his enemies but is not allowed to participate in group fighting. He is allowed to have only one fellow komusō with him during the fight. Only samurai are allowed to behave thus. 17. A komusō is not allowed to ride a horse or use a palanquin during his itinerancy, in order to avoid facing too many people. 18. When a komusō arrives at the borderland of a country, he should politely demonstrate his credentials which were given by the main temple and be allowed to pass freely. If a komusō avoids passing by the official checkpoint, he should be interrogated. Be prudent and respect the regulations! 19. When a komusō practices takuhatsu outside his territory in a castle town, he should not stay there for more than seven days. During his takuhatsu practice he should never play secular music or popular tunes. He is not allowed to participate in any artistic activities. 20. When a komusō is practicing takuhatsu, he should not use a shakuhachi that is shorter than one shaku (30.3 cm) and eight sun (1/10 of shaku) in length, nor play different pieces than those prescribed. 21. Komusō discipline has been established for all samurai under the sun. Do not forget the right path of chivalry, because at every moment a komusō can again become a samurai. Learn the priest trade, and in your heart enhance chivalry. Remember that this is a religious sect for the bushidō. Hence you are granted to travel freely throughout the country."